Is deep learning a Markov chain in disguise? Andrej Karpathy’s post “The Unreasonable Effectiveness of Recurrent Neural Networks” made splashes last year. The basic premise is that you can create a recurrent neural network to learn language features character-by-character. But is the resultant model any different from a Markov chain built for the same purpose? I implemented a character-by-character Markov chain in R to find out. First, let’s play a variation of the Imitation Game with generated text from Karpathy’s tinyshakespeare dataset. Which snippets are from the RNN and which are from the Markov chain? Note that Karpathy’s examples are from the complete works, whereas my Markov chain is from tinyshakespeare (about 1/4 the size) because I’m lazy. Well, your wit is in the care of side and that. England all out what least. Be satisfied! Now, sir. Whose noble souls I'll have the heart of the wars. If you can’t tell, don’t be hard on yourself. The humble Markov chain appears to be just as effective as the state-of-the-art RNN at learning to spell (olde) English words. How can this be? Let’s think about how each of these systems work. Both are taking a sequence of characters and attempting to “predict” the next character in the sequence. The RNN does this by adjusting weight vectors to get an output vector that fits the specified response. The hidden layer maintains state over the training set. In the end, there is a confidence value attributed to each possible output character, which is used to predict the next character. This tells us that 40% of the time, the letter ‘a’ follows the sequence ‘walk ‘. When producing text, we can either treat this as the predicted value, or use the pmf to dictate the sampling. I chose the latter since it’s more interesting. But how is state captured in the Markov chain since by definition a Markov chain is stateless? Simple: we use a character sequence as the input instead of a single character. For this post, I used a sequence of length 5, so the Markov chain is picking a next state based on the previous five states. Is this cheating or is this what the RNN is doing with hidden layers? While the mechanics of RNNs differ significantly from Markov chains, the underlying concepts are remarkably similar. 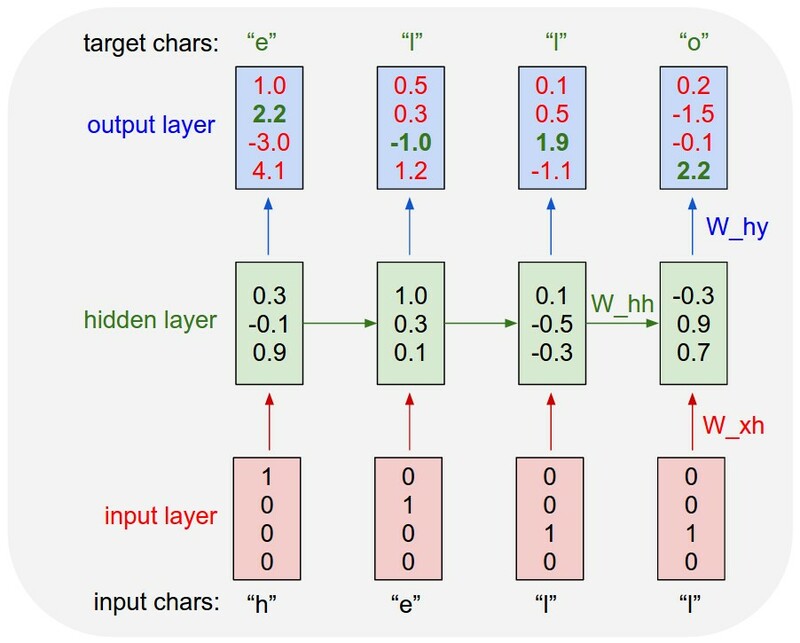 RNNs and deep learning might be the cool kids on the block, but don’t overlook what’s simple. You can get a lot of mileage from simple models, which have generally stood the test of time, are well understood, and easy to explain. NB: I didn’t use a package to train and run the Markov chain, since it’s less than 20 LOC overall. A version of this code will appear in a forthcoming chapter of my book. Brian Lee Yung Rowe is Founder and Chief Pez Head of Pez.AI // Zato Novo, a conversational AI platform for guided data analysis and automated customer service. Learn more at Pez.AI. Bottom line is that LSTM RNNs solve long range dependencies pretty effectively while markov chains fail miserably. RNNs brings us one step closer to modelling long range dependencies, a problem that nlp folks have been trying to solve for years. Thanks for sharing that link. I agree that the linux kernel example is a better demonstration of the power of RNNs. One thing that is interesting to me is whether the capture of long range dependencies is unique to RNNs or can they be captured with something as simple as a Markov chain. Clearly Yoav has shown that a vanilla one won’t, but what if you add exponential weighting and multiple layers. Will that produce something comparable? CRFs (not linear chain CRF) can be used to model such dependencies. However, for long range, without any prior intuition, one would have to use a sliding window for neighbor information. This makes inference impractical. I am yet to understand how CRFs compare with RNN in terms of inference when considering long range dependencies. I’ve been reading about CRFs recently. They seem somewhat like a generalized parser. From that perspective, it seems like you could add another parameter to the functions that represent long term state and work from there. Very interesting! Would you mind sharing your code? (I realize this is old, but…) it’s pretty clear that 1 and 4 are RNN, and 2 and 3 are HMM. You can tell by the fact that 1 and 4 show much more understanding of actual grammar and sentence structure. E.g. 3 has “I’ll afford show’d” which makes very little sense. which has perfect grammar – something a HMM can’t (with decent probability) produce. If you substituted some nouns for some other nouns in the sentence, it would actually make sense.